The Tokyo Metro is a rapid transit system that serves the capital city of Japan, Tokyo. The system began operations in 1927 as Tokyo Underground Railway. It presently has 9 lines serving 179 stations, and a total track length of 195.1 km. The system is operated by Tokyo Metro Co. Ltd., which was formed jointly by Ministry of Land, Infrastructure, Transport and Tourism (MLIT) and Tokyo Metropolitan Government. As per 2010, statistics, the metro had a daily ridership of 6,307,390 passengers per weekday. 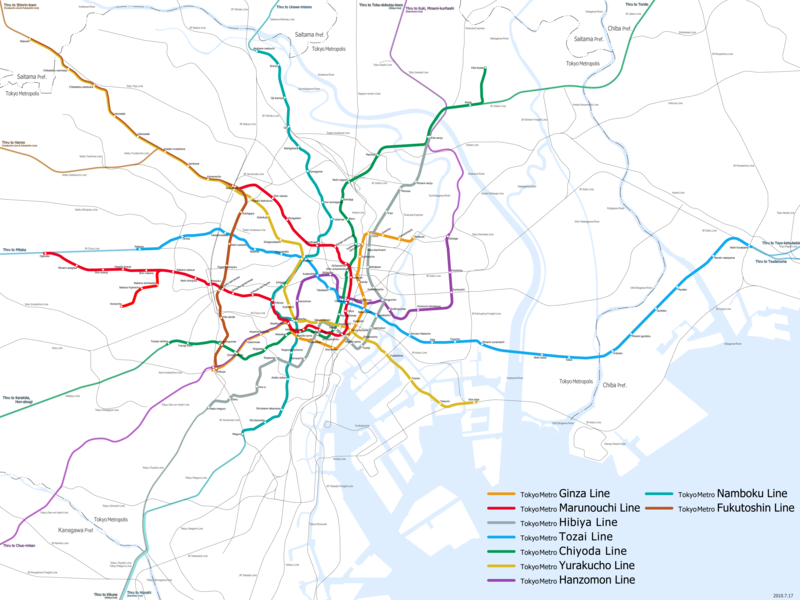 Tokyo metro, which is formerly known as Eden has two subway operators, and there are nine Tokyo metro lines that provide access to Tokyo’s city center and other major places. Toei train operates through the other four lines. There are also other several Tokyo metro lines that provide services to railway lines at their final station. Tokyo metro lines can be recognized by their color and marks. G Line 3- Line 3 is marked G, and it is named as Ginza line. The metro train runs through the route between Shibuya and Asakusa. Line 3 has a length of 14.3km and the route covers 19 stations. M Line 4 – Line 4 is marked as M and the name of the line is Marunouchi line. The metro train runs through the route Ogikubo, and Ikebukuro serves 24 stations. The length of this route is 24.2 km. The Marunouchi line branch line also runs through another route from Nakano-Sakaue to Honancho serving 4 stations. The line is denoted by m and the length of this line is 3.2km. H Line 2 – line 2 is marked as H and the name of this line is the Hibiya line serving 21 stations in total. The metro train runs between Naka-Meguro and Kita Senju. The length of this route is 20.3km. T Line 5 –line 5 is marked as T and the name of this line is Tozai line serving 23 stations in total. The metro train runs between Nakano and Nishi-Funabashi. The length of this route is 30.8 km. C Line 9 – The name of this line is Chiyoda line, and the line is denoted by C. The metro train runs from Yo Yogi –Uehara to Kita- Ayase. This route serves 20 stations and the length of this route is 24 km. Y Line8 – the name of line 8 is yurakucho, and the line is denoted by Y. The metro train runs between Wakoshi to Shin-Kiba. Line 8 serves 24 stations. Z line 11- The name of this line is Hanzomon line, and the line is denoted by Z. The metro train runs between Shibuya and Oshiage serving 14 stations. N line 7 – The name of this line is Namboku and line 7 is denoted by N. The metro train runs between Meguro and Akabane-Iwabuchi serving 19 stations. F Line 13 – The name of this line is Fukutoshin, and the line is denoted by F. The metro train runs from Wakoshi to Shibuya serving 16 stations. Map showing various stations and lines of the Tokyo Metro System in Japan. Click on the map to enlarge it. You can also download the PDF of Tokyo Metro Map. The metro services start around 5:00 am and run until 12:30 am. The frequency of the trains is 3 minutes during peak hours and around 10 minutes, during off peak hours. Regular Tickets can be obtained from the vending machines at the stations. The prices are distance based. For a distance of 1-6 km, the ticket costs 170 yen. For children, it costs 90 yen. For a distance of 7-11 km, the price for adult is 200 yen and for child is 100 yen. For a distance of 12-19 km, the price is 240 yen for adult and 120 yen for a child. For a distance of 20-27 km, an adult ticket costs 280 yen, while a child ticket is for 140 yen. For a distance of 28-40 km, the ticket costs 310 yen for an adult and 160 yen for a child. Riders can also buy tickets in a pack called Coupon Tickets. Ordinary Coupon Tickets are sold in packs of 11, and can be used any time of the day. The price is equivalent to the price of 10 regular tickets. So for a distance of 1-6 km, a coupon ticket for adult costs 1700 yen and for child, it costs 900 yen and so on. There are Off-Peak Coupon Tickets that are sold in packs of 12 and have adult fares. The tickets can be used on Monday-Friday 10 am to 4 pm, on weekends and holidays and Dec 30-31 and Jan 2-3. Weekend/Holiday Discount Coupon Tickets are also available. The metro system also offers passes for frequent travelers. There is Student /Commuter Railway Pass that allows travel on a specified route. Another pass is the Tokyo Metro All Line Pass. This pass is valid on all metro lines and allows unlimited travel. Both the passes are available for a period of 1, 3 and 6 months. The cost of 1 month Tokyo Metro All Line Pass is 17,300 yen, for 3 months is 49,310 yen and for 6 months is 93,420 yen. The metro has a PASMO Card, which is a prepaid smart card and can also be used for other railway and bus operators nationwide if they allow interoperability. In addition, the system also provides various discount tickets and fares according to age. There is free parking space available near each Tokyo Metro station. At some metro station, riders will be required to pay parking fees to get a convenient place to park your vehicle. The Tokyo metro provides ‘Women Only’ cars during the morning rush hours, from the start of service to around 9.30 am. Smoking is prohibited in the stations at all times. The metro system offers free Wi-Fi at all metro stations. The stations also have slopes, guide blocks for visually impaired people and also have Braille information boards. The display information at stations, and train announcements are both in English and Japanese. I cannot find fare for Oedo line.